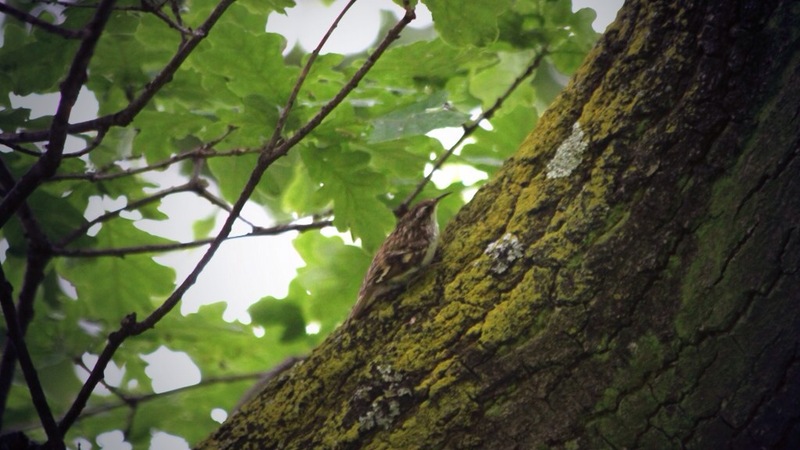 I spotted this Treecreeper in Hyde Park the other day. Treecreepers have always been in my top five birds; I love to watch their secretive tree trunk acrobatics. They travel from the bottom of a tree upwards, spiraling around the trunk, then along the branches looking for insects. Once they have thoroughly searched one tree, they fly to the base of the next and the process begins again. It is almost as if the Treecreeper is magnetic, and someone is moving a powerful magnet within the tree trunk; sometimes the bird follows the imaginary magnet smoothly, and other times it gets a bit stuck and needs to jerkily jump along to catch up. In fact Treecreepers do make jerky hops with both feet at once when ascending trees, they use their tails as props to help them balance. Long, very sharp claws allow these birds to hang upside down from the underside of branches. Their long slightly curved beak is the perfect tool for poking into bark crevices and retrieving weevils, beetles, moths, woodlice, spiders and others small prey items. Their camouflage is superb, and very often it’s the jerky movement that gives away the birds presence. A true tree dweller living in the city!